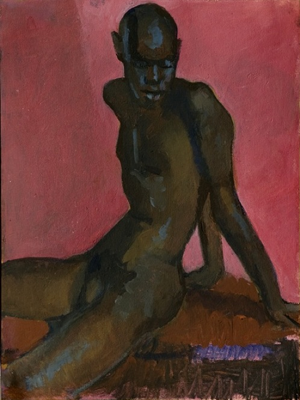 Trinidadian artist Boscoe Holder (1921 – 2007) was the consummate Renaissance man. He led a celebrated artistic life as painter, dancer, costume designer, choreographer, dance instructor at the University of the West Indies, leader of an international dance group for nearly twenty years, band leader, and pianist. Holder began playing the piano at age five, and by his seventh birthday he had begun painting, self-taught. As a teenager, enamoured of his island’s culture, he researched and learned the local dances and songs, and by the late nineteen-thirties he had formed a group of dancers and was producing shows depicting theatricalised versions of these songs and dances of Trinidad. At the same time he gave several solo art exhibits, and became a founder and life member of the Trinidad Art Society. When American military bases were installed in Trinidad during the Second World War, Boscoe Holder had his own programme, Piano Ramblings, on the U.S. Armed Forces Radio Station, WVDI. The show aired every Sunday afternoon. His dance company also performed constantly at various Officers’ Clubs and U.S.O.’s, and Holder was commissioned by scores of servicemen to paint their portraits so that they could send them home to their loved ones in America. In 1946 Holder visited Martinique, and this inspirational sojourn broadened his vision, prompting him to include the dances, songs and costumes of the French West Indies in his shows. In 1947 he went for the first time to New York, teaching Caribbean dance at the Katherine Dunham School, and exhibiting paintings at the Eighth Street Galleries. Holder married English-born Sheila Clarke in 1948 and the couple had a son, Christian, the following year. In 1950 they travelled to London, which became their home for the next twenty years. Holder formed his group, Boscoe Holder and his Caribbean Dancers, in London, and introduced the first steel drums to England on his own television show in 1950, Bal Creole (aired on B.B.C. TV which, in those seminal days, was located at Alexandra Palace). Appearances in several cabarets, theatre clubs, television shows, and films followed. The company performed before Queen Elizabeth II at her coronation in 1953: representing the West Indies, they danced on a barge, part of the Royal Flotilla, on the Thames. They toured the Continent, appearing in Finland, Sweden, Belgium, France, Spain, former Czechoslovakia, Italy, Monte Carlo, and also in Egypt. In 1960/61 Holder took three months off to return to Trinidad as the recipient of a Refresher Fellowship, a “Scholarship in Reverse”, given by the Trinidad government to Holder and writer V.S. Naipaul to entice them to return to the land of their birth. Holder and his wife appeared for a second time before Queen Elizabeth II at a Command Performance at Windsor Castle in 1955. In 1966 they were among the eighteen persons invited to dine with the Queen and Prince Philip at Claridges, in London, in honour of Her Majesty’s forthcoming visit to Trinidad and Tobago. As a painter in England Boscoe Holder exhibited at the Trafford Gallery, the Redfern Gallery, and the Commonwealth Institute in London, and at the Castle Museum, Nottingham. Two of his paintings were bought by the Leicester Galleries. He also exhibited at the Martell Exhibition of Paintings, Drawings and Sculpture, held at the Royal Water Colour Society Galleries. In 1981 Sir Ellis Clarke, former President of the Republic of Trinidad and Tobago presented Prince Charles and Diana, Princess of Wales, with a Holder painting as a wedding gift from the Republic. 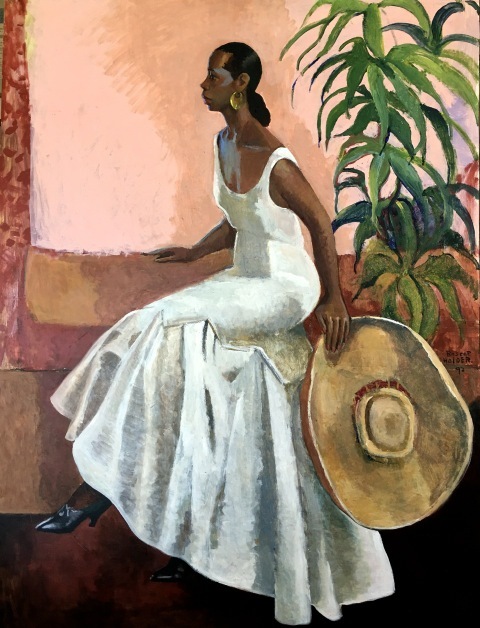 Returning to Trinidad in 1970 Boscoe Holder concentrated mainly on his paintings. They have been featured in Town and Country magazine (March 1983), and Islands Magazine (April 1985). In recognition of his contribution to the Arts, the Government of Trinidad and Tobago awarded Holder the Humming Bird Medal (gold) and named a street after him in 1973. In 1978 he was the recipient of Venezuela’s highest decoration, the Order ofFrancisco de Miranda. Together with his younger brother, Geoffrey, he received an award from the International Voluntary Service (IVS) in Washington, D.C. for his contribution to the Arts in the Caribbean, and 22nd May, 1983 was declared Boscoe Holder and Geoffrey Holder day by the mayor of D.C. On 7th April, 1991, Boscoe, his son, Christian, and Geoffrey received, in Philadelphia, the first Drexel University Award for International Excellence. He was awarded, in 1994, the Médaille de la Cité de Paris (bronze) by the former Mayor of Paris, Jacques Chirac, at the 7th Salon of Painters and Sculptors from Overseas. Through the eighties Holder has exhibited his paintings in Puerto Rico, and in Cannes, in Curaçao, and in Nassau, Bahamas. In 1987 he held a one-man exhibition in Toronto at the Metro Convention Centre, and celebrated his 50th anniversary as a professional painter at the Art Creators Gallery in Port-of-Spain. In 1988 there was a retrospective of his paintings, the earliest dating from the late 1930’s, entitled, Beauty In The Eye Of The B. Holder, hosted by the Venezuelan Embassy in Port-of-Spain.1989 saw Holder’s work exhibited in Greenwich, Connecticut, at the Garden Center, sponsored by the Galerie Bonheur, and in 1991 he was invited by the Alliance Française and the French Cultural Mission in St. Lucia to hold an exhibit of his paintings there. In 1992 and ’93 he exhibited at the Gallery 1,2,3,4, in Port-of-Spain. There were also exhibitions in Jamaica and Guyana, plus the publication of a biography and chronology with colour plates, entitled Boscoe Holder, published by Maclean Publishing Ltd.
On 31st October, 2003, The University of the West Indies conferred upon Mr. Holder an Honorary Degree of Doctor of Letters (DLitt). Earlier that year Campbells of London included several of Mr. Holder’s paintings in their exhibit of Caribbean painters. 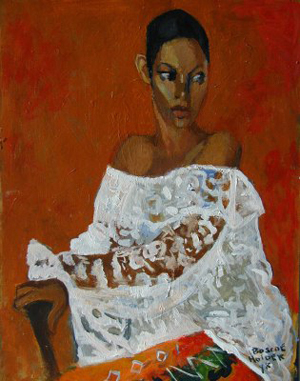 In 2004 Mr. Holder exhibited at the Gallery St. James in Barbados. The Government of Trinidad and Tobago issued, in December 2004, an official Christmas series of postage stamps featuring six of Mr. Holder’s paintings. From the late 1990’s until his death Boscoe Holder held annualexhibitionsat101 Art Gallery in Port-of-Spain, Trinidad. He celebrated the millennium by building his own studio and gallery next door to his home. Posthumously, several of his paintings have been included in exhibitions at the Michael Werner Gallery in Berlin, and the Victoria Miro Gallery in London.